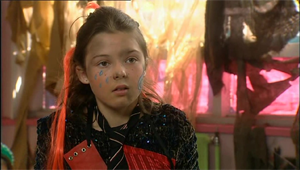 Lottie is first seen in series five, episode eight as a stray being chased away from the school by Ebony, who, is making the school her new base. Lottie's next appearance is a few episodes later in Liberty at Ruby's Saloon. Lottie steals, and is caught by Ruby. Ruby doesn't want thieves in her saloon and is thinking of sending her away, but she decides to let her stay at the saloon. After Mega is defeated, Lottie and Ruby go to the Mall and decide to make it their new home. 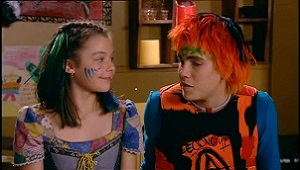 It's there that Lottie finds a friend in Sammy and together they try to make Darryl famous, but it does not work. As Mega's new virus is released the Mall Rat's escape down to the harbor, Lottie is trapped in Gel's wardrobe (she wanted to take something from Gel's room, and hid in the wardrobe from Gel). Amber finds Lottie, and together they arrive at the boat just in time. Lottie is very friendly and cute, but also wild, daring and unkempt. She also is a kleptomaniac which gets her into a lot of trouble. She finds a mother figure in Ruby, who always cares for her. She only had one outfit throughout Series 5. Her overalls are made of yellow denim. Under it she wears an art printed patchwork top and a corset of heavy denim. On her head she wears a peaked cap and on her arms red or pink stripped sleeve cuffs.